Snuggle up with this tender relaxed vintage TV stand. 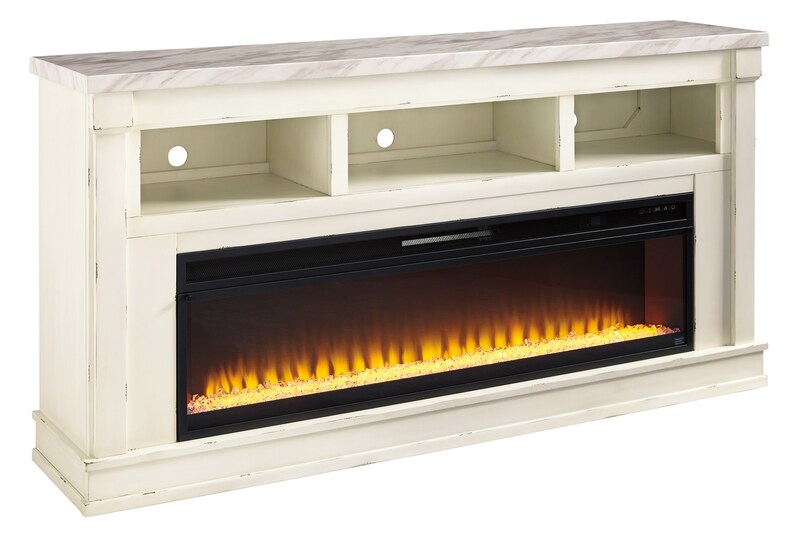 Perfect for those cold evenings or romantic date nights, the distressed white finish gives the piece a softer sentimental expression while the built-in fireplace warms up the room with its gentle glow. The TV stand's three cute shelves are eager to keep your media devices neat and tidy with its wire management openings and ventilation cutouts. Polishing off this pleasant piece, the faux marble top adds a modern splendor. This TV stand fits a 75" TV. The Becklyn Relaxed Vintage TV Stand with 3 Shelves and Fireplace by Signature Design by Ashley at Suburban Furniture in the Succasunna, Randolph, Morristown, Northern New Jersey area. Product availability may vary. Contact us for the most current availability on this product. Browse other items in the Becklyn collection from Suburban Furniture in the Succasunna, Randolph, Morristown, Northern New Jersey area.